Every once in a while a photo of a luminescent beach somewhere brings me back to the week I spent in the Solomon Islands, in the Pacific. At less than 50,000 visitors per year this is definitively one of the least visited countries in the world. Most of you are probably wondering where or what it is. I, too, was completely unaware that such place existed until I researched the area at the recommendation of a friend. Getting there is half the fun, or the drama, depending how you look at it. There are flights from Port Moresby, in Papua New Guinea, in itself another country in the least visited list, and from Fiji, twice a week only. You also have the occasional flight from Brisbane. The capital, Honiara, is one of the least developed places I have ever been to, at a similar level as Port Moresby, Brazzaville, Juba and other truly abandoned cities. There is very limited infrastructure and once you venture for about 10km out of town you are bracing yourself for the true jungle: no pavement, absolutely no signs and no brick construction in sight. The forest and the vegetation have simply taken over. When I was there, it rained almost every day so my memories of the place are filled with mud and dirt. You can imagine what happens in a place where there is nil infrastructure and virtually no sewage or water drainage system as it rains non-stop for more than a few minutes. Nobody seemed to care too much though. We were walking on a few inches of mud and I couldn’t help but wonder if this was how the Pacific would be. Being the first country I visited in the area on a 2-month sabbatical it was a refreshingly chilled out place. And me being me, I quite loved the randomness and isolation of the place – it felt as if it had been forgotten and that, always appeals to me. There were a couple of places to eat, and by a couple I do actually mean two. One of them was a sort of Yacht Club where almost every foreigner would set foot at least once during their stay. They had live music and local dances, hence the appeal. As you may have guessed by now, Honiara did not impress me. Thankfully, I had an additional day in the Capital on the way back from Gizo Archipelago which improved my feelings for the place a bit. The rain truly made it look much gloomier than it was. When the sun came out, the local market was in full bloom and the buzz of the city gave it a much more interesting and appealing look. Not to mention that instead of walking on mud, I was walking on dust which is a significant improvement. 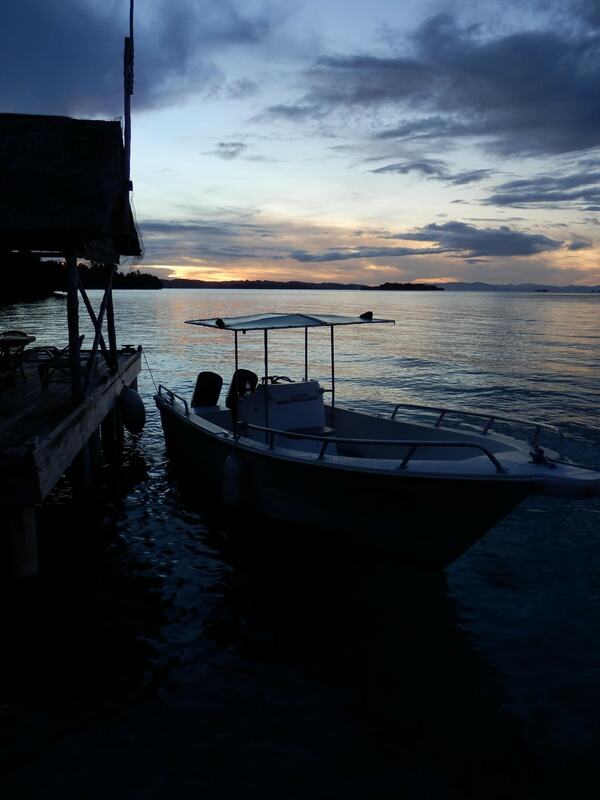 The luminescent waters were not in coastal Honiara but in idyllic Gizo island. 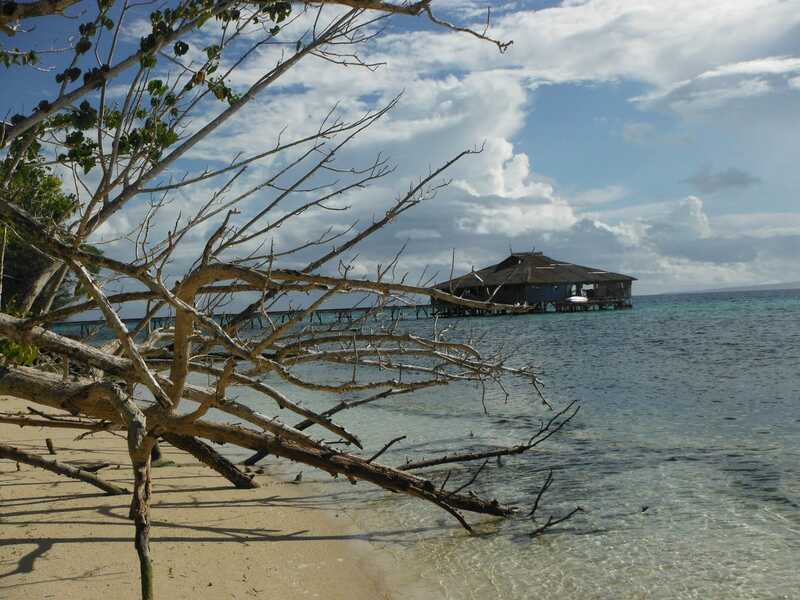 A short flight from the capital but a world away Gizo Archipelago is a treasure trove of marine life and sparkling waters, even after earthquakes and ensuing tsunamis recked the area in 2007. The flight is a good predictor of your stay. Any foreigner will be glued to the window staring into the postcard perfect landscape that does not have anything to envy other well-known island paradises like the Maldives or Fiji. Here the waters are clear and so blue that they could have been painted. Island after island and reef after reef of pure isolation and untouched beauty. Most of them are uninhabited and the ones which are have even barer infrastructure. The plane eventually lands on a tiny air strip flanked by water on either side. The hotel has sent a group of rastafaris to pick us up. They look more like pirates than water taxi drivers but we take the plunge anyway. 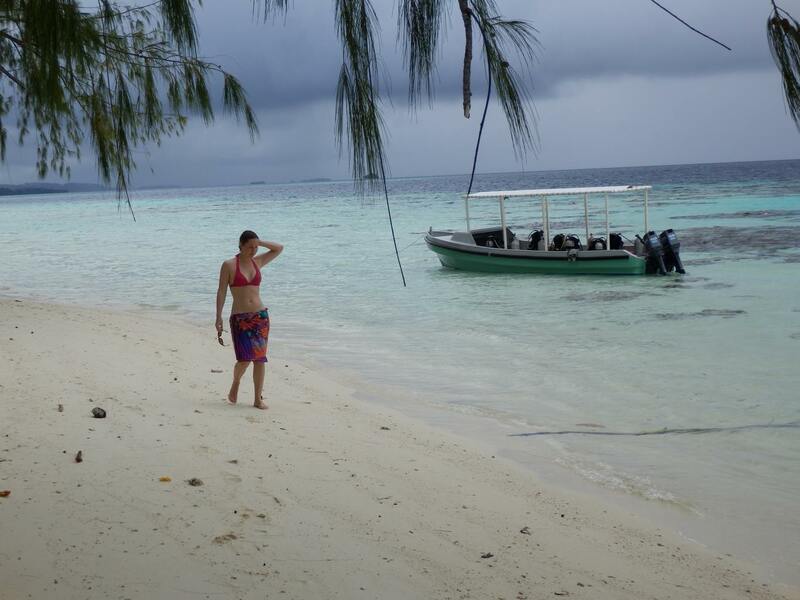 It is a very short 15min boat ride to our beach bungalow. Gizo is a stunning place. We spent the days without phone signal, with no internet and with limited electricity. Evenings passed drinking bottles of red wine to the candlelight and breakfasts turned into lazy mornings and afternoons. We took a couple of diving trips with a Spanish dive master couple who had somehow ended at the other end of the world. One morning, we ventured out on a kayak to Kennedy Island. It proved to be quite dangerous and challenging. Although the island was very close the current was too strong and as much as we rowed we seemed not to move. It was better to simply drift back to the beach but stubbornly, we carried on and made it there to find a fisherman cooking lunch. In all the time we were there we saw no other tourist except for the last evening when we went for dinner to a nearby higher-end resort which had internet (one of only two places to stay). It was very small so all in all there may be, at most, about 20 foreigners at any given time in the entire archipelago. After dinner, we were caught up in a typical tropical storm which felt as if it was going to pull away the entire resort and us with it. This is how a tropical storm always feels when you are in the tropics: as if it is the last one you will ever see. Tossing you and the hut you may be in around, whistling through the gaps, swinging the palm trees. In the morning, as the rage subsides, everything goes back to normal as if nothing happened. A few bottles of wine later, seen as it did not look like it would stop anytime soon we resolved to jump on the speedboat back to our resort anyway. We were gracefully given oversized raincoats that did cover me entirely from head to toe but they did not stop us from getting drenched anyway, the rain was in full force. The boat’s engine starts and off we go towards the hotel in the darkest of nights. All of a sudden, the wind and the rain did not matter anymore. I looked down into the water and saw it become fluorescent, bright as if somebody had pointed a blue light torch at it. As the boat violently moved across the angry waves, the agitated plankton kept shinning more and more. It was spectacular and breath taking. I realized that, under the large hood of my raincoat, was a huge ear to ear grin. Nobody could see it as it was pitch dark and we had no torches or light. All we could see was the luminescent plankton as if reflecting the starry night now covered in clouds. Studies on the matter have even attracted Nobel Prize attention. reading about it later I realized that the ability of generating their own light that this plankton has is their way of handling life in the pure darkness. Their way of finding food and mates. At that time, I did not know what it was, it just felt like magic. It was a very special goodbye to us. Every time I see one of these compilation of luminescent plankton beaches I always remember Gizo, for it is never included in these as most people don’t even know of its existence. Let it remain one of my best kept secrets and a place that forever stays in the list of least visited countries in the world for I shall return one day to bathe in the brightest of nights.